THE BEST, WORST, AND MOST OVERLOOKED TUNES FROM THE MID 50'S THROUGH 1979 - IT'S TIME TO CRINGE OR SMILE! 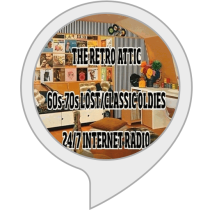 DJ Gilbert Matthews welcomes you to The Retro Attic, a 24/7 internet radio station that primarily plays those classic and seldom heard top 40 entries from the 60's and 70's, along with a sprinkling of late 50's and early 80's hits that also fit the format. 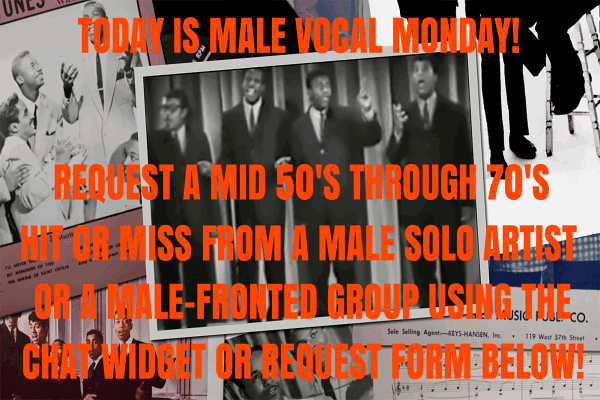 Hopefully our wide variety of oldies will be mind-blowing musical history lessons for you! A couple of "Bottom 45's" from each decade will be included every hour; these are defined as minor charters(peaked between 41 and 100), Bubbling Under/Looking Ahead entries(peaked between 101 and 150), non-charters, or tunes that were only hits in Canada, the UK, or Australia. A track from our "Featured Artist Of The Month" will also be heard every 2 hours(hopefully returning in May 2019). Sit back, have fun, and take yourself back to simpler times(when people smiled at each other and didn't question why, kids played outside all day, and parents never worried)! You can also find us on Shoutcast, Virtual Radio, Nobex Radio, Delicast, Streamfinder, Tunein.com(highly recommended for those of you who use mobile apps), and ITunes Radio in their "Golden Oldies" category. Feel free to chat with me, DJ Gilbert Matthews, through our live chat widget in the bottom right corner of our webpage. HAPPY LISTENING! 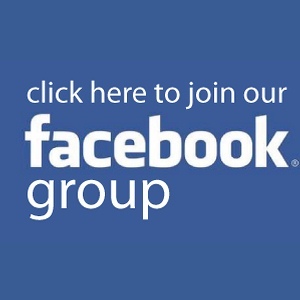 Spread the word about us and join other fellow oldies lovers in our Facebook group(search for The Retro Attic)! CLICK BELOW TO HEAR THE RETRO ATTIC! NOW PLAYING ON THE RETRO ATTIC! RECENTLY PLAYED ON THE RETRO ATTIC! EACH ENTRY HAS LINKS FOR LIKE/DISLIKE, WIKIPEDIA, YOUTUBE VIDEOS, AND AMAZON PRODUCT BUYING! SONG REQUEST FORM(YOU CAN ALSO USE THE CHAT WIDGET) PLEASE LIMIT 2 REQUESTS PER DAY FOR NON-MEMBERS CHARTING OR NON-CHARTING SINGLES ONLY(NO ALBUM TRACKS) PLEASE SEE OUR VIP MEMBERSHIP DETAILS BELOW HERE IF YOU WOULD LIKE TO REQUEST MANY MORE! BECOME A LIFETIME VIP MEMBER FOR ONLY $25.00! You get unlimited listening, you get to make unlimited requests(no artist overkill, please), you get to ban a specific song or a specific artist from the rotation for a month, and you get to be put in a drawing for a customized 2 hour theme block once a month! 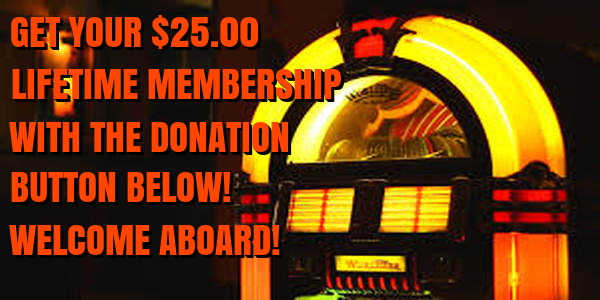 Use the first PayPal button below here if you would like to come aboard! If you just want to help out and genuinely appreciate what I do, then you can come up with your own one-time donation amount or use the "Subscribe" button for becoming a monthly subscriber! YOU MAY USE THE BELOW BUTTON IF YOU WOULD LIKE TO BECOME A MONTHLY SUBSCRIBER! HELP US REACH OUR APRIL NEW VIP MEMBER GOAL(91 MORE PEOPLE TO GO)! PLEASE SHOW YOUR APPRECIATION AND KEEP US ON THE AIR! POTENTIAL SHUTDOWN IS ON APRIL 30TH! RETRO ATTIC OLDIES TV! VIDEOS RELATED TO OUR JANUARY 2019 NEW ADDS! 1957: Joe Bennett And The Sparkletones/The Bobbettes/The Four Lads/Dale Hawkins/Dale Cook(lost oldie). 1960: Johnny Preston/Jimmy Charles/June Valli/Little Willie John/Paul Chaplain And His Emeralds(lost oldie). 1980: Andy Gibb/Michael Stanley Band/Natalie Cole/Ali Thomson/The Skids(lost oldie). Coming in May will be the resurrection of "The American Bottom 45." This will be a 1 hour show that will play nothing but lost oldies(just like the description above) from a specific year. More details will be coming soon! Visit us at http://retroatticrareoldiesradio.com and tune in through our "Live Streaming" button in the middle of the page, just a little below our header. You can also tune in through the page's Tunein dot com icon link or the 4 free downloadable mobile app icon links. Requests are always accepted through the webpage's request form or here on Facebook. You can also like us on Facebook(search for The Retro Attic) or follow us on Twitter(@melrocker65). Do You Have Nagging Oldies Music Questions That Remain Unsolved? Click On The Image And Sit With The Guru(guru, guru...)! TWITTER FEED/FOLLOW US ON TWITTER! THE RETRO ATTIC ON AMAZON/ALEXA! Do You Have An Alexa Device? Would You Like The Retro Attic On It? Click On The Above Image To Be Taken To Us In The Amazon Alexa Skills Store! Enable Us For Free, Say "Alexa, Play The Retro Attic Oldies Station," And You're All Set! JOIN THE RETRO ATTIC'S FACEBOOK GROUP! Get The Scoop On Upcoming Shows And Potential New Adds! Click The Picture Above And Ask To Join! If You Were A Fan Of Classic MTV And All Of The Hits And Misses From The 80's, Then Check Out Our Sister Station By Clicking On The Above Image! Besides Being On Nobex Radio(See The Icons Below), We Are Also On The Popular Platform Known As Tunein.com! Click On The Above Image To Be Taken To Our Listing! Make Sure To Put Us In Your Favorites And Feel Free To Leave A Comment! Click On The Above Image To Download Our Free Android App! Click On The Above Image To Download Our Free Blackberry App! Click On The Above Image To Download Our Free Windows Phone App! BECOME A FAN OF MY FACEBOOK PAGE! SOME OF MY FAVORITE SITES! ATOMIC RADIO - An internet radio site consisting of DJ-run specialized shows(such as The Retro Cafe, hosted by Glen Mason). One cool thing they do is they show themselves on air, something I probably will never have the courage to do! Definitely worth checking out! GARAGE HANGOVER - An extremely comprehensive site dedicated to 1960's garage rock bands(ones who were on small record labels with 45s that command 3 or 4 digit sales these days). You can look forward to plenty of rare pictures, comments from sessionmen and/or the band members themselves, and the opportunity to hear their songs! MONKEES LIVE ALMANAC, THE - An excellent history of the group's tours from 1966 through 2012 with lots of rare pics, concert clips, and TV appearances(audio and video)! OUTFIELD, THE - The official website of the British trio known for 80's hits such as "Your Love" and "Voices Of Babylon." They released a new CD in 2011 called "Replay" that you need to check out if you haven't done so already! STEVE HOFFMAN FORUMS - If you're extremely knowledgable about music, movies or audio/visual hardware, then this is a great place to talk shop and ask questions to the experts! I frequent it quite a bit.